Todays development of digital technologies almost removes technical barriers that are limiting users’ access to audiovisual materials and collections. Electronic catalogues and other database software enable us to discover content quite easily and fast. At the same time national aggregators or services like “Europeana” provide possibility to surf through cultural heritage kept at a number of various institutions just with a few clicks of the mouse. However, undefined number of records still cannot be accessed by the broad public because of legal issues. Common practices and most importantly, legislation regarding copyright vary from country to country. This years’ conference was jointly organized by BAAC and Estonian Film archives, and hosted by the Estonian National library. Conference theme - “Digital access and copyright”. 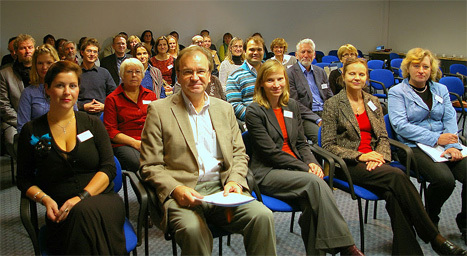 Topics like “Copyright as a selection criteria for digitization”, “ Databases with audiovisual content – best practices”, ”Public access and copyright law – how to find a harmony?” and “Copyright and “invisible heritage” – how much material remains hidden because of the copyright law?” were included in the agenda. Event was attended by a large group of Estonian participants, representing wide range of cultural institutions, as well as participants from other Baltic and Scandinavian countries, France, Belgium, Germany, Poland, and Canada. First day of the conference was traditionally opened by the BAAC president and representatives of the organizers; welcome speech was given by the Norwegian Ambassador in Estonia, HE Lise Grevstad, who kindly supported this event. A total number of 8 papers were presented during 3 sessions. These papers mostly discussed technical and legal issues related to databases. Representatives from 3 well known AV digitisation and preservation companies Memnon, Front Porch Digital and CubeTec introduced their approach and services. At the end of the day all participants were invited to evening reception at a cozy medieval hall at Tallinn city archives, located in the heart of the Old town. During the evening, a very interesting tour of the archive was arranged. Second day started with BAAC General meeting. As usual, annual report was presented and other organisational topics discussed. This year it was time for election and a new Board was formed. Newly elected president is Zane Grosa (Latvia), vice-presidents are Maarja Savan (Estonia) and Juozas Markauskas (Lithuania). During the General meeting members of BAAC also approved important statement on the proposed EU Orphan works directive, which was prepared in advance by the BAAC Board member Pekka Gronow. This statement reflects position of BAAC and suggests vital changes in the directive. After the General meeting the second day of the conference continued. Seven speeches were given, most of them discussing questions of copyright and how it influences the access of AV collections held at different institutions. The memory institutions of the Baltic States share many uncertainties with regard of works from Soviet times and their rights status. Svein Prestvik from NRK, Norway told about the streamlining and changes at their archives. Conference presentations are available at our presentation section.